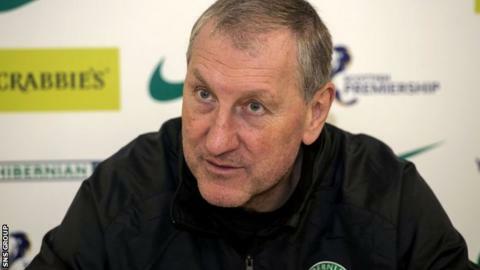 Manager Terry Butcher insists Hibernian still have much to play for following their Scottish Cup exit. Hibs sit seventh in the Premiership - four points behind St Johnstone, who have played a game less. "We can certainly salvage something from this season and it's well within the players' capabilities to do just that," Butcher told BBC Scotland. "We have a nine-game sequence before the league split and we want to do as well as we can." The Easter Road side have finished in the bottom half of the top flight in the last three campaigns and Butcher is eager to rectify that. "If we get to the points total we want, hopefully that will be enough to get us in the top six," he added. "We want to get back to winning ways against Ross County on Saturday; that's our only focus of attention now." Former Inverness boss Butcher took over in November suffered just one loss in his first nine games. However, last weekend's 3-2 reverse to Raith Rovers in the cup was a fourth consecutive defeat for his side, with three of those coming at home. The former England captain was critical of his team in the wake of their loss to Championship opposition but is backing them to make amends. "These are the same players that went on a good run when I first got here and they can do it again," he added. "That's our aim and ambition and that's what's driving us forward. It's difficult to look further ahead than the next nine games. "The project hasn't changed as far as I'm concerned, it's just going to take a bit of time. This is a great job and like any other it has its ups and downs."